How do I set up the LF-S50G? To use your Google Assistant with your wireless speaker, you will first need to install the Google Home app on your smartphone/tablet and go through the initial speaker setup. Depending on the services (e.g. Spotify or Google Music) you subscribe to, you may have to create extra service accounts in addition to a Google account in advance. Access Google Play or the App Store on your smartphone/tablet. Install the Google Home app on your smartphone/tablet. 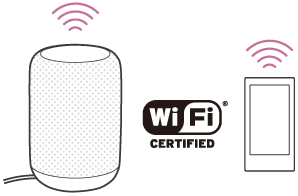 Set the speaker to have the same Wi-Fi connection as your smartphone/tablet. We kindly refer you to the Google Home app setup FAQ. How do I set up the LF-S50G Smart speaker?